Definition: In business parlance, a change agent is an individual or group, who carry out the task of instigating and managing change in the organization. He/She is someone, who directly or indirectly influences change, i.e. the change agents are appointed by the organizations to transform the ways, the organization is managed, or the business is conducted. The change agent can be internal or external to the organization who plays the role of a catalyst to implement change in the organization. Internal Change Agent: When the change agent, is internal to the organization then he/she is usually the employee such as a manager, senior executive, leader, HR professional or any other person from the staff who has mastered in behavioral sciences and intervention technology of organization development. They are appointed by the organization to look after the change process. External Change Agent: The external change agent is the one who is brought to the organization from outside such as consultants.The company’s rules regulations and policies are not imposed on them, and so they can deeply analyze and bring different viewpoints to a situation and challenge the existing state of affairs.However, this can also be seen as a disadvantage, as the external change agent is not aware of the company’s history, work processes, and personnel. Change agents aim at making changes in the existing processes or culture of the organization that sticks. And to do so, they focus on the matters relating to organizational effectiveness, innovation, and advancement. He/She is someone who always seeks an opportunity for change, determines the best approach and bring about change. They are the one who possesses skills and competencies to initiate, facilitate and coordinate organizational change. Change Agents help the organization in understanding the requirement and relevance for change and takes all necessary steps required to manage change and also anticipates the problem; that might take place during or after the change is implemented in the organization. He is responsible to transform vision into a realistic plan and execute it. Cognitive Skills: The skills which require some level of pro-action from the side of the change agent for the purpose of self-understanding, conceptualization, and evaluation. 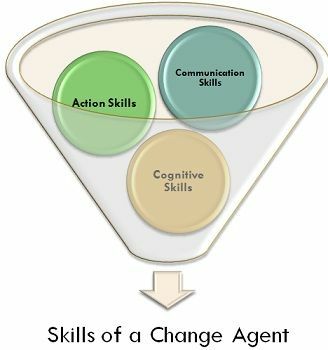 Action Skills: Change Agent works as a consultant, researcher, trainer, counselor, etc. in an organization, so, he/she should possess required skills and competencies. Communication Skills: He/She is responsible for spreading change information, and making the organization realize the need for change, for which he/she must possess excellent communication and pervasive skills. Many multinational corporations have their own in-house change specialist, who works with the management team of the organization to recognize the need for change and facilitate change efforts. just wondering the date of which this was published?